A nine-foot replica of The Gurdian is located on the Second Floor. Enoch Kelly Haney’s colossal statue The Guardian stands prominently atop the Oklahoma State Capitol dome where it was lifted on June 7, 2002. The 17 feet tall statue holds a staff that reaches 22 feet into the sky. This monumental project was completed in ten months and demanded 4,000 pounds of bronze, which was cast in 50 sections. Haney’s own family served as models for this historic piece. Haney’s son William and Haney’s grandson, Enoch, inspired the guardian’s eyes and cheeks respectively. Inside the 2nd floor rotunda, visitors can view a nine-foot replica of The Guardian, which was donated by Nancy Payne Ellis and her children. During the dedication, Senator Haney gave a voice to the guardian, revealing the representation of all Oklahomans through the statue. The Guardian embodies the diversity within the proud and strong population of Oklahoma while serving as a reminder of our tumultuous times. The sculpture signifies the thousand of Native Americans that were forced from their homes during the 1800s and the sons and daughters that survived the devastating Dust Bowl. The towering statue exemplifies the valor of Oklahomans and their ability to overcome the most horrific catastrophes such as the bombing at the Murrah Building in Oklahoma City. The Guardian is a reminder that just below him within the halls of our grand Capitol, the true guardians of Oklahoma, our legislators, are working everyday to improve this already magnificent state. Truly a modern-day renaissance man, Enoch Kelly Haney’s talents span two separate spheres - namely politics and art. Born on November 12, 1940 to William Woodrow and Hattie Louise Haney, Enoch grew up in Seminole, Oklahoma. The son of a full-blood Seminole and Creek Indian, Haney’s own grandfather was chief of the Seminole Tribe in the 1940s. Haney’s interest in Indian people is evident in his art, as he puts a great amount of energy into the research and documentation of Native American culture and traditions. His work is exacting in its detail and representation of native peoples. Haney received his Associate of Arts degree from Bacone College, and his Bachelor of Arts in Fine Arts from Oklahoma City University. In 1962, Haney was honored with the Rockefeller Foundation Scholarship at the University of Arizona. 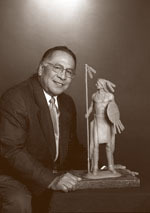 Haney was designated as the Master Artist of the Five Civilized Tribes in 1975; he also was awarded a Governor’s Art Award, Distinguished Alumni Award, and the Indian Heritage Award. Along with his work as an artist, Haney has served terms in the Oklahoma House of Representatives, as well as the Senate. Haney’s colossal statue The Guardian stands prominently atop the Oklahoma State Capitol dome where it was lifted on June 7, 2002.